Hardcover, 8 x 10.25 in. / 144 pgs / illustrated throughout. 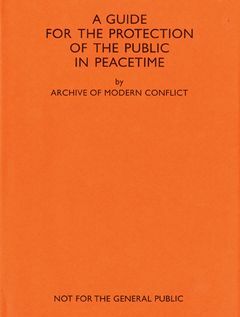 A Guide for the Protection of the Public in Peacetime explores the psyche of conflict—from the primal tribalism of paint and feathers through the ideal of the chivalrous warrior to the scientific clinical quality of triggers and switches. Renowned photographers join previously unpublished ones in creating this multifaceted portrait of war zones. FORMAT: Hbk, 8 x 10.25 in. / 144 pgs / illustrated throughout.